Sichuan (四川) is known as the land of abundance in China for having amazing food production capabilities and lots of natural resources. For tourists Sichuan is known for stunning natural beauty, ancient history, super spicy food and very pretty girls. Sichuan is a favorite place for travelers when visiting China. One of the main attractions to Sichuan for tourist is that this province is the home to the mysterious panda. The Giant Panda has become representation of China in modern times. Pandas are not the only major attraction in Sichuan. The Sichuan basin is home to many interesting ancient civilizations including some that predate a unified China. There are also stunning mountain retreats were monks still pray every morning. Along the southern border with Yunnan is the home to the rarely visited Yi people. Then the foothills of the Himalayas call for many travelers to visit them to see Tibetan communities still living a traditional life style. From the busy city of Chengdu to the beauty of Mount Emei and Jiuzhai Valley National Park, Sichuan has plenty to offer. Sichuan’s geography can be defined as the Sichuan basin, with the Yangtze River flowing down it, framed by mountains to the north, south and west. In the mountains to the north and west there are long winters with mild summers. While in the basin the winters are mild and summers extremely hot and humid. The southern mountains have a moderate climate year round making them very nice. The Sichuan basin and southern areas of the province are cloudy most of the year, which is why the Republic of China moved the government to Sichuan during World War II, although current day Chongqing, to protect it from Japanese bombing. Sichuan shares domestic borders with Chongqing, Tibetan Autonomous Region, Qinghai, Gansu, Shaanxi, Guizhou and Yunnan. Sichuan has no international borders. Emei Shan is a stunning mountain offering great multi day hikes to little Buddhist monasteries. Leshan is home to the Grand Buddha. The mountains west of Chengdu rise to over 5,000 metres making these mountains home to Tibetans and their cousins the Qiang. The further west you get from Kangding the more you enter the world of tall mountains, deep valleys, grasslands, yaks and the nomads that live there. For many tourists this is an excellent way to experience Tibetan culture without having to deal with all the red tape involved in visiting the Tibetan Autonomous Region. Kangding is a large border town between the Tibetan world and the Han world making it a good spot to spend a few days. Moxi is the home to a nice bon temple and is a stepping stone to Hailuogou Glacier Park. Ganzi is a good place for high end shopping and has a few nice temples. Manigango is home to some famous Nyingmapa monastery and surrounded by stunning mountain lakes. Dege is a hard to get town and has a traditional Tibetan printing press. 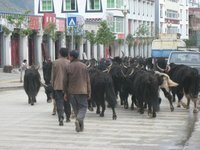 Litang is a very traditional Tibetan town and is the backdoor to Yunnan. Songpan is the starting point for horse trekking and a stopover on the way to Huanglong National Park or Jiuzhaigou Nature Reserve. Huanglong is a scenic and historic interest area in the northwest part of Sichuan. It is located in the southern part of the Minshan mountain range, 150 kilometres north-northwest of the capital Chengdu. This area is known for its colorful pools formed by calcite deposits, especially in Huanglonggou (Yellow Dragon Gully), as well as diverse forest ecosystems, snow-capped peaks, waterfalls and hot springs. Huanglong is also home to many endangered species including the giant panda and the Sichuan golden snub-nosed monkey. Huanglong was declared a World Heritage Site by UNESCO in 1992. Jiuzhai Valley is a national park situated in the north of Sichuan province. It is bordered by Huanglong National Park. It is thought by many to be China's most beautiful spot inspiring numerous poets over the years. Jiuzhaigou is Chinese for "nine village valley", named after the nine local Tibetan villages that inhabit it. It was declared a UNESCO World Heritage Site in 1992 and also has UNESCO Man and Biosphere, Green Globe 21 and various Chinese national accreditations. The Leshan Giant Buddha a statue that was carved out of a cliff that lies at the confluence of the Minjiang, Dadu and Qingyi rivers in Sichuan province in China, just south of the city of Leshan. It was built between 731 and 903. The stone sculpture faces Mount Emei. This whole area was listed as an UNESCO world heritage site in 1996. It is the largest carved stone Buddha in the world and at the time of its construction it was the tallest statue in the world. From top to bottom it is 71 metres, and at the shoulders it’s 28 metres wide. Due to the pollution coming from nearby factories and the city, the old statue has suffered mainly superficial damage. Luckily it was not damaged during the Sichuan eartquake on May 12, 2008. 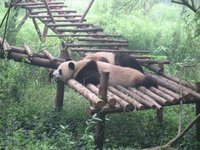 The Sichuan Giant Panda Sanctuaries, located in southwest Sichuan, are home to more than 30% of the world's highly endangered giant pandas and is among the most important sites for the captive breeding of these pandas. It covers 9,245 km2 with seven nature reserves and nine scenic parks in the Qionglai and Jiajin Mountains. Along with the giant panda, the sanctuary is a refuge to other endangered species such as the red panda, the snow leopard, and the clouded leopard. Outside of the tropical rainforests, it is among the botanically richest sites of the world, and is home to between 5,000 and 6,000 species of flora. It has been noted that the region is similar to the paleo-tropic forests of the Tertiary Era. In the major cities in the Sichuan basin all Han Chinese holidays are celebrated. In the minority areas, mainly in the mountains, local festivals are celebrated. The weather in Sichuan can range from bitterly cold winters (December-March) in the mountains to hot weather in the lower areas during summer (June-September), when temperatures can reach 35 °C or even a bit more. The major hub for transport to and from Sichuan is in Chengdu. Therefore it makes sense to start any trip in Sichuan in Chengdu. Chengdu Shuangliu International Airport (CTU) is located 16 kilometres from downtown Chengdu and is one of the biggest and fastest growing airports in China. There are dozens of airlines serving both Chinese cities as well as destinations in the eastern part of Asia, like Macau, Hong Kong, Japan, Bangkok and South Korea. The only destination further away is Amsterdam, served by KLM. To reach most of the other areas in Sichuan bus is really the only option, although there are some options of getting there by train. Only a few towns in the eastern third of Sichuan have airports and most of them are pretty small. The only major airport is in Chengdu and there is a tourist airport near Jiuzhaigou Nature Reserve that only operates during the summer. It is possible to take trains to most major cities in the eastern third of Sichuan. There are no trains presently in western or northern Sichuan. For traveling in the western or northern parts of Sichuan bus is the only way. Remember that the roads are pretty basic and there are frequent landslides. This can make a 6-hour bus ride turn into a 72-hour bus ride very quickly. With few airports and most trains not running in the western two thirds of the province, bus is the main option for getting around. Be prepared for frequent land slides and delays while traveling in western Sichuan. There are several new highways going in but most are in the Sichuan basin area. Sichuan cuisine is well-known worldwide, including dishes like Kung Pao Chicken (gong bao ji ding 宮保雞丁) and Twice Cooked Pork (回鍋肉). It is also famously spicy, with liberal use of chilies and the indigenous Sichuan pepper (花椒; huājiāo). One specialty of the area is the Hot Pot (火锅; Huoguo), a sort of wide-mouthed soup pot into which an assortment of vegetables and thinly sliced meats are dropped to cook. Typically, the pot has two parts separated by a partition; one side is extremely spicy, the other milder. This is version 21. Last edited at 7:15 on Aug 16, 17 by Utrecht. 28 articles link to this page.